Welcome to the next post in the Earning Stories series right here on Rewards Canada. For years we have provided you with the details on earning points and miles (both regular earning and bonus opportunities) and these stories show the actual offers in action. This story revolves around my recent family trip and looks at the earning story for our car rental by crediting the rental to Carlson Rezidor Hotels Club Carlson program. Both Avis and Budget have amazing bonuses for Club Carlson members but they were more expensive and included kilometer restrictions so it made choosing National even easier. 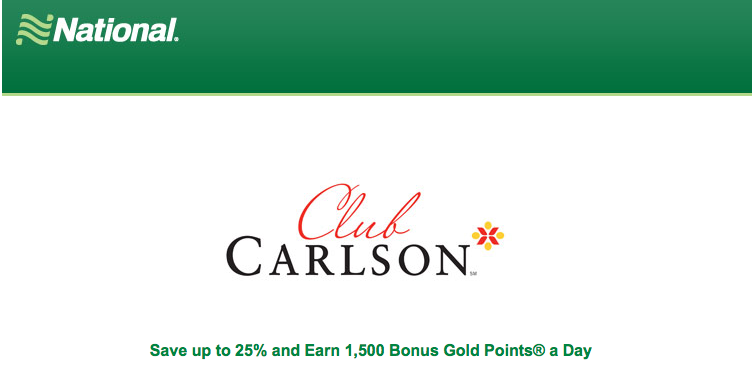 Not to mention I am still pestering Budget and Club Carlson for my 8,250 Bonus Points for an early April rental! Budget says they submitted it and Club Carlson hasn't responded to my email yet. So next week I'll chase those points again. 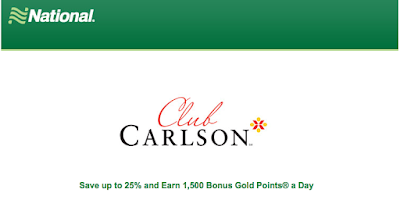 At the outset of the rental we ended up earning the 1,200 base Club Carlson Points (300 per day) plus the 6,000 bonus points from the offer (1,500 per day) All told 7,200 points posted from the rental which is not too far off from a 9,000 point award night redemption! They also posted within a week of the completion of the rental! I think Budget could learn from this. There you go. Bonus Points offers in action! Overall I think this was yet another great earning action for the rental and for what we paid. We like to rent SUVs but I could see people getting an even better return on a promotion like this by renting a smaller vehicle that does not cost as much! - Watch the rates that include bonus miles - For us it is about 50/50 in terms of earning bonuses on rentals, many times rates are out there that are quite a bit cheaper and provide more value versus paying more and earning more miles. For a complete list of car rental bonus offers see this page on the main Rewards Canada site. - Read the fine print - When a bonus offer is available be sure that your rental meets the criteria. Those are primarily minimum number of rental days and vehicle type. There are many promotions that don't get awarded on the smallest/cheapest vehicles. - Join the Car Rental company's program - Hertz Gold Plus Rewards, National Emerald Club and others all provide great benefits such as dedicated check in counters, bypass check in counters and more.